Modelling thermal destruction of microbial populations can be split into several levels. The first level is called the primary destruction model. It involves describing the destruction kinetics (changes to the size of the population over time). The model’s main parameter is the duration of the decimal reduction (D), which leads to a ten-fold reduction of the population size. The secondary model describes the changes to the primary model parameter (D) caused by environmental factors. It takes account of the effect of the main factors such as temperature and pH. A primary model describes the evolution of the population size vs the heating time. Heat destruction kenetic is often log-linear. Heat resistance is characterised by the ‘D-value’, i.e. the time that leads to a 10-fold reduction of surviving population. To describe physico-chemical factors impact on thermal destruction, modular approach consists to model each factor independently. 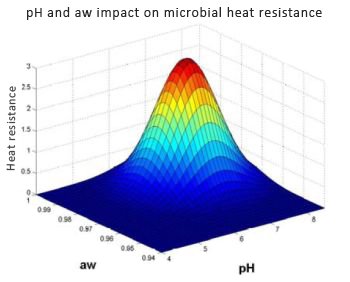 Each factor (pH and aw) affects heat resistance at 2 levels : The first one increases destruction during the heat treatment, and the second one inhibits the most damaged bacteria after heat treatment (respectively written X and X’ in the model below). 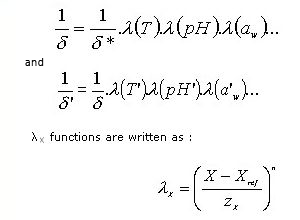 ∂* is the first decimal reduction time in standard conditions (T, pH et aw), λX is the function related to the x factor. 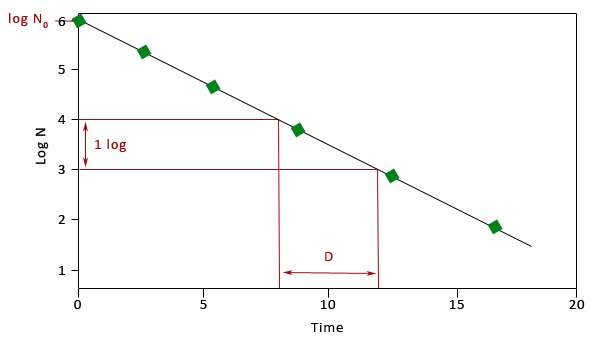 ∂ is the first decimal reduction time in studied environmental conditions. zX express the difference between X and Xref that leads to a 10-fold reduction of ∂*.